As a top-notch streaming music service, Spotify brings over 140 million users over 30 million songs for every moment - on computers, mobiles, tablets, home entertainment systems, cars, gaming consoles and more. Spotify can be accessed for free: find and hear playlists, discover new music, share music and playlists, listen to tunes picked by Spotify’s Radio feature, and play any playlist, album, or artist (only in Shuffle Play mode on mobile). Spotify songs can be downloaded for offline listening if you subscribe to Premium, which costs $9.99 per month. Is it possible to listen to Spotify offline for free? 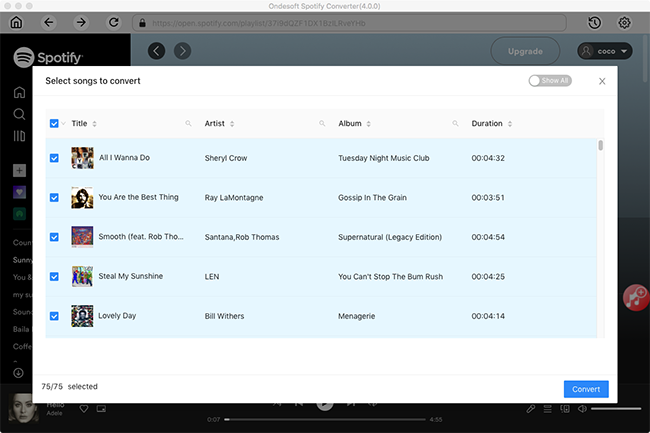 Well, with Ondesoft Spotify Music Converter , it is extremely easy. 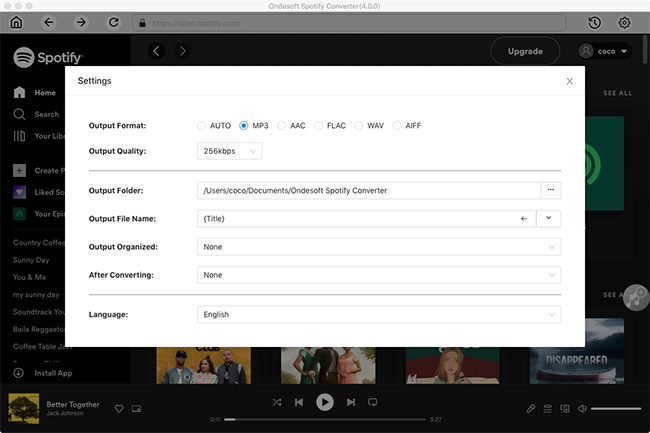 Ondesoft Spotify Music Converter allows you to convert Spotify songs, albums or playlists to MP3, M4A, WAV or FLAC by a few clicks. 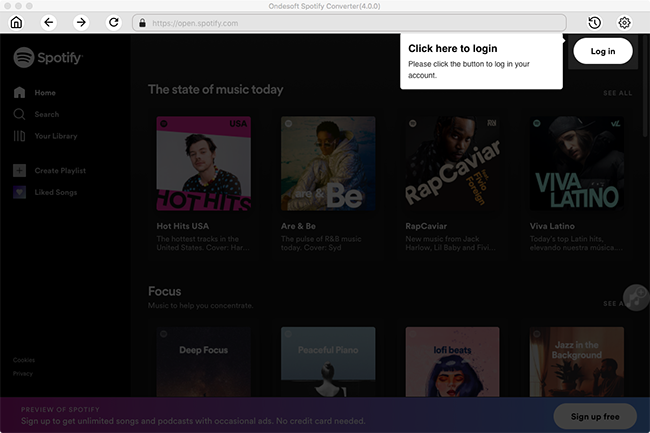 Then, you can listen to the DRM-free Spotify songs offline on any Mac, PC, iOS, Android, Windows phone, MP3 player without Spotify app. The limitations of Spotify free will all disappear. You can get Spotify premium for free. The following tutorial shows you the easy way to download Spotify songs, albums or playlists to MP3/M4A/WAV/FLAC and listen to Spotify music offline for free. Please make sure you have installed Spotify app on your computer. 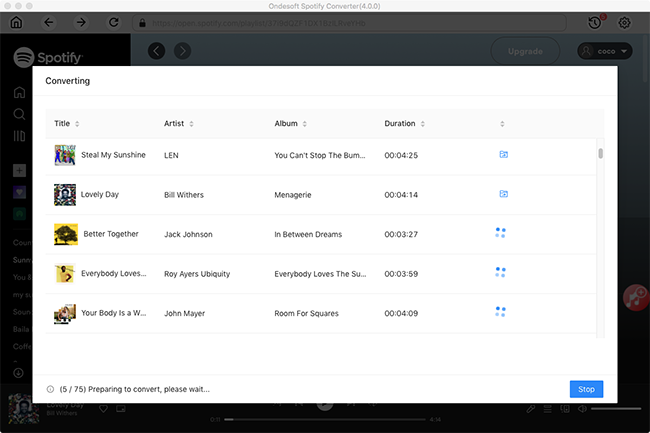 Download, install and run Ondesoft Spotify Converter on your computer, then Spotify will be opened automatically. You can click the Add Files button on the top-left. 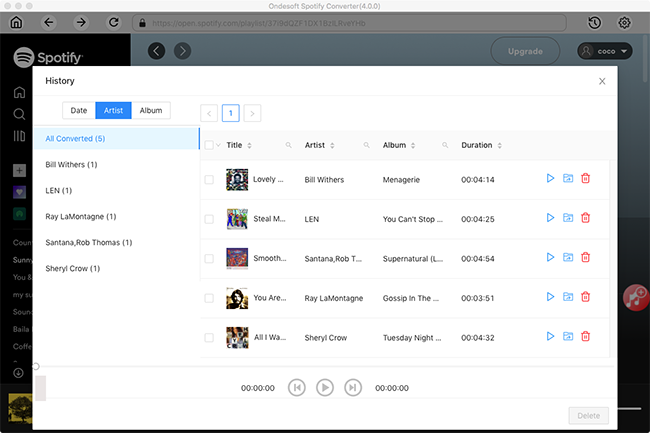 Then choose the songs or playlist you would like to convert in Spotify, and drag them to the main interface of Ondesoft Spotify Converter. Or you can copy and paste the relevant link from Spotify web player to the search box. Finally, click the Add button to finish adding songs. Click the Options button to change the output format. In the Advanced settings, you can choose output format (MP3, M4A, FLAC or WAV), output quality (High 512kbps, medium 320kbps, 256kbps, low 128kbps). In the output settings, you could change the output folder as you prefer. When finish customization, click the Convert button to start the conversion. After the conversion done, you can find the converted audios by clicking the History button. All converted Spotify music is DRM-free. You can move these converted files to any editing tools and edit them freely. How to use Ondesoft Spotify Converter?